Today I'm going to interview Carolyn Arnold, author of the recently published Ties That Bind, a mystery novel. Carolyn also graciously agreed to give away an ebook copy of her book. To qualify, leave a comment at the end of this post, along with a way for her to get in touch with you. Carolyn was one of the first authors I discovered when I began to explore social media. 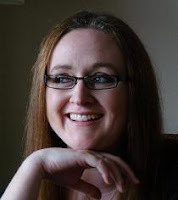 She runs a great blog detailing her experiences as a writer, and she's also a strong force for good in the writing community, as she not only promotes other writers on her site, but she also tweets and retweets helpful writing tips. 1. You’ve just self-published your first mystery novel, Ties That Bind. Tell me a little bit about your book. It’s the first in my stand alone mystery series surrounding Detective Madison Knight. 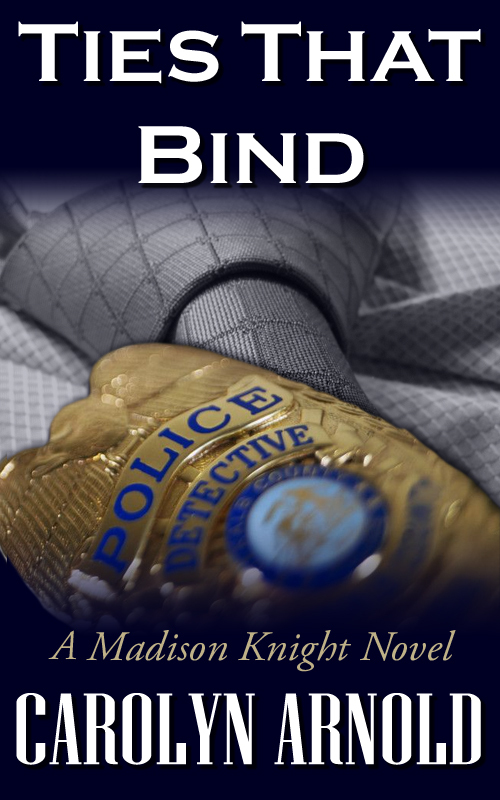 In Ties that Bind, Detective Madison Knight concludes the case of a strangled woman an isolated incident. But when another woman’s body is found in a park killed by the same line of neckties, she realizes they’re dealing with something more serious. 2. I know from reading your blog that a lot of research goes into each of your books. What type of research did you conduct when writing Ties That Bind? Since the murder MO (method of operation) is strangulation, I had to research that topic. What happens to a body when it is strangled, what signs does it leave behind? I needed to know about estimating time of death, as well as other forensic processes. I also had to research cops, and detectives to verify their positional responsibilities, as well as the hierarchy within a police department. I also researched crime scene investigation – how it’s conducted, and how evidence is handled. I needed to know the order of arrival at a crime scene, as well. I’m sure there’s a lot I’m overlooking, but there was definitely a lot of research that went into it. 3. Madison Knight is the main character in Ties That Bind, and I know you have at least two other novels planned for her. Describe what inspired you to create Madison. I’ve actually written the other two already, but they’re at different stages of editing. Answering the question about what inspired me is almost hard to say...I started Ties that Bind in 2008. And the version I have now is vastly different from where it started. But I’d have to say that I just wanted to write a mystery series with a strong female lead. I wanted a woman who would say things I wouldn’t necessarily dream of saying. I didn’t want her afraid of authority or mousey like some fictional female cops come across – letting their stronger, male partner take the lead. 4. You finished three of your seven novels while working a full-time job. Describe your writing schedule during that time. Did you give up eating and sleeping? I actually finished all seven of my novels while working full-time. I know where you pulled the three, though. You really did your research on me :) I guess all I was stressing on my blog when I mentioned this, was that three were completed in one year. That number of books in a twelve month period was a record for me. As for my schedule – whenever I can fit it in. I love first thing in the morning. I’d wake up with a couple coffees, and write. Then, I’d tote my laptop off to the day job, and write on lunch break. And on weekends or holidays, I’d write for hours. There were times I even booked days off work just to write the full day. Those were exhausting, yet such satisfying days. 5. You’ve written books in the suspense and thriller genres as well. Tell me more about those. I have written 1 suspense novel, and 2 thrillers. Restitution, my suspense novel, has a lead character who was in so much pain, he needed his story told. It was my first attempt at first person POV, but I believe it turned out quite well. It’s still not refined to the point of publication, but I’m hoping for late 2012. My first thriller, Assassination of a Dignitary, was written for Nanowri in 2010. I’m extremely proud of that book for numerous reasons. It came in as my longest novel, just shy of 110k, and was written in the shortest length of time. Brandon Harper never expected this when he signed up as a Special Agent for the FBI. Working in the shadow of Veteran Special Agent Jack Fisher, his career seemed set. But when the team is called to a small rural town where the remains of ten victims are found in an underground bunker, buried in an unusual way, Brandon knows he'll never return to his normal life. With one empty grave, and the case touching close to home, he fears he's become the target of a psychotic serial killer who wants to make him number eleven. Only thing is everything Brandon thinks he knows is far from the truth. 6. Are there any authors who are particularly inspiring to you? I’d have to say Sandra Brown and David Baldacci. Brown goes where I wouldn’t normally dare to go. She’s gritty, and detailed. Baldacci pulls me into the powerful and corrupt world of politics, a world I’ll never be a part of in real life, and inspires me to build powerful characters who have questionable morals. His pacing, and attention to character details and background have helped me to realize that it’s worth the investment of words to delve into these facets of our characters, and in fact it is crucial that we do. 7. In your blog, you discussed your decision to go the indie publishing route with Ties That Bind. Do you have any tips for newbie writers who are considering self-publishing? Make sure you have your novel exactly where you want it, and don’t rush into it just because you want to see your name on Amazon. This is your reputation, and it will follow you along. Put out something that is as perfect as you can get it. If this means a professional editor, hire one. Another good tip – be realistic. Not everyone is going to like your book, just as you don’t like every book you pick up. Just because you have might have a thousand followers on Twitter, it doesn’t mean everyone’s going to buy your book. Things take time. You can’t expect the world to stop and take notice because you published your book. Other people are doing the same thing every day. But don’t be discouraged. Write well, write clean, write consistent, and eventually you’ll build up a readership. 8. You actively use many forms of online social media. How important do you think social media is for self-published authors? Very. As a self-published author, online social media gives you a platform. This is essential. Otherwise, how do you even have a chance of making any sort of ripple? There are a lot of books out there, and even less time. 9. In addition to your upcoming two Madison Knight novels, what’s next for you as a writer? Although, I’d love to write my next novel for Nano this year, I’ll be working hard on getting two novels out so I’m not sure if that will happen. As mentioned above, Eleven is slated for 11/11/11, and Justified (the second in the Madison Knight series) is slated for the start of December. Carolyn Arnold was born in 1976 in the rural town of Picton, Ontario. Currently she lives with her husband of fifteen years and her two beagles in Southwestern Ontario. She has been an aspiring writer since her teen years when she began writing short romance novels. But as life has a way of doing, it can mute your dreams into the background and it wasn’t until 2007 when she was reunited with her love of the written word. Her drive to complete one novel, turned into several.